I suppose if you had to self-extract a wisdom tooth with a tuna gaff it might be worse than enduring A Countess From Hong Kong, but at least you’d feel better afterwards. 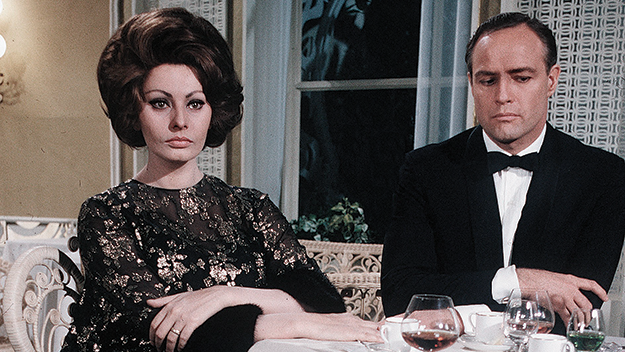 Charlie Chaplin came out of retirement to write, co-produce, score and direct Marlon Brando and Sophia Loren in this 1967 wet thud that might have been amusing in 19 thirty-seven, when Chaplin first had the the script ready. “The Little Napole—whoops–Tramp” also dropped his son Sydney (awful) and daughters Geraldine, Victoria and Josephine into the drink, and did a painful cameo himself. A diplomat finds a beautiful countess (there are no hag countesses in movies) stowed away in his stateroom on a voyage and must keep everyone else from knowing–including his wife (gee whiz!). Illustrative of how the two stars got along. The actors are game but lost (yes,at sea) under the amazingly leaden writing and pancake-flat staging. I saw it on TV as a kid and recall it being just dull. Seeing it lately it was shocking to watch it flounder, and the ‘seasick’ scene rates a 10 on the cringe-for-actors scale. It’s capital-B Bad of the “you’re kidding” variety. Also wasted are Tippi Hedren (at 37, fled from Hitchcock persecution only to land here) and Margaret Rutherford, 75,in one of her last appearances. Brando, who looked forward to working with Chaplin, found him on set “probably the most sadistic man I’d ever met. 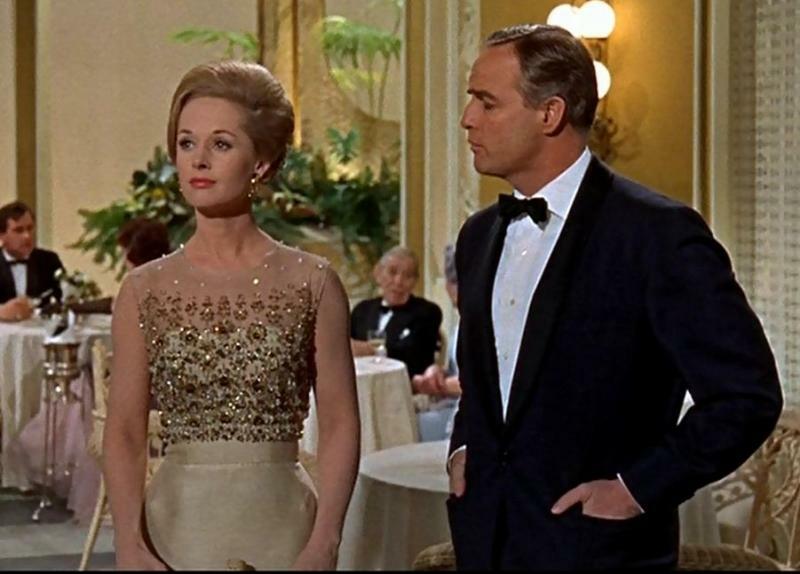 He was an egotistical tyrant and a penny-pincher.” Marlon and Sophia did not get along at all. Chaplin remarked that they “each clasped the other as if embracing a werewolf”–and the chemistry deficit shows. She is lovely as ever. Savaged upon release, and fizzling at the tills, this groaner now has a few inexplicable champions: witness the oh-put-a-sock-in-it drivel from Richard Brody of The New Yorker, lauding its 2012 DVD release-–“its political perspective goes even deeper, to the long-standing,and long-unchallenged moralism that results in pervasive hypocrisy.” It took 45 years for this movie to get a laugh, and it came from a magazine. Only passable thing to come out of this was “This Is My Song”, a Petula Clark single that spun off from Charlie’s theme music. It hit #3 in the U.S. As for the movie, ‘Charlie’s Last Stand’ lurched to #78 for the year, grossing $2,700,000.